Peruvian director Claudia Llosa won Golden Bear for her film "The Milk of Sorrow." BERLIN, Germany (CNN) -- Jury President Tilda Swinton joked that when she first came to Berlin it was difficult to keep her eyes open. The late night parties, trudging through heavy snow to the Palast for early morning screenings and then being seated in a warm, dark cinema proved the perfect combination for inducing sleep. 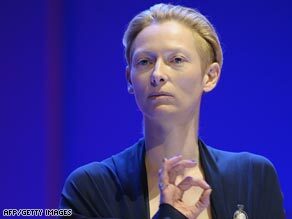 Actress Tilda Swinton, Jury President at this year's Berlin International Film Festival. Twenty years later, at the 59th Berlinale there were plenty of films to keep Swinton and the rest of the international jury awake. It is a cineaste's heaven, with over 400 movies crammed into ten days. Only the truly dedicated could manage to see them all, but highlights included Jose Padilha's return to Berlin. Padilha won the 2008 Golden Bear for darkly gripping favela drama "Tropa De Elite." His new documentary film "Garapa" is and extraordinarily stark film. Shot in black and white, stripped of any fancy post production techniques or music, the film is a powerful illustration of the impact of chronic starvation. It follows three families living in Brazil where the children survive on a mixture of sugar and water -- "Garapa." After the premiere, Padilha spoke passionately about breaking the poverty cycle. His film offers no answers but "Garapa" shows that further questions must be raised about the inadequate solutions in currently in place. The much-anticipated German premiere of Stephen Daldry's post-holocaust film "The Reader" brought actress of the moment Kate Winslet to the red carpet. Hollywood glamour was also provided by René Zellwegger, Michelle Pfeiffer and Demi Moore. Steve Martin impressed a weary press pack with delightful banjo plucking at the "Pink Panther" press conference. The award for the best party has to go to Vice Films for Dominic Murphy's movie "White Lightnin." Actor Ed Hogg gives an outstanding, if ocasionally hard to watch, performance as Jesco White in the film that brings the tortured life of the American hillbilly to the screen. Hogg was one of the last to leave the party, long after the sun had come up. Films from South America seemed to capture the hearts of Tilda Swinton and her so-called "magnificent seven" fellow jurors. "Gigante" a love story about a big man with a big heart earned Uruguyan first time director Adrian Biníez three awards. The film was not ready until 48 hours before Biníez flew to Germany, and the stress and lack of sleep meant he lost his voice on the first day of press interviews. Even so, Biníez was a more than deserving winner. As for the top prize, the Golden bear made its way back to Peru with director Claudia Llosa for her film "The Milk of Sorrow." The film deals with the impact of the twenty-year war between the Peruvian army and Shining Path guerrillas. It was an unexpected win that gave this small South American nation with an even smaller film industry its first Golden Bear. Tears followed gracious acceptance speeches and before you know it, it's all over for another year. Let's hope the 60th Berlinale celebration of film will be full of even more surprises.